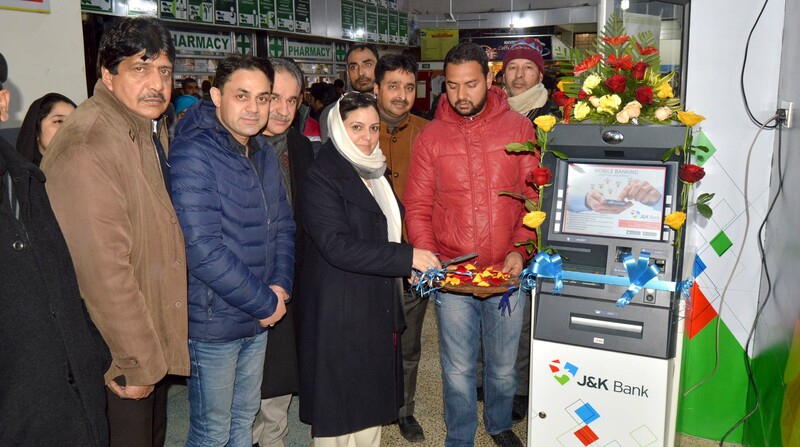 Srinagar, Jan 10: With a view to facilitate patients and their attendants as well as general public, J&K Bank on Wednesday commissioned an Automated Teller Machine (ATM) inside the premises of Khyber Medical Institute here at Srinagar. Commissioning of the ATM alleviates inconvenience faced by patients and their aides with regard to availability of cash and other related services inside the hospital premises as well as reaffirming J&K Bank’s outreach to the financial needs of all sections of the society. Expressing gratitude towards the bank management for installing the ATM inside the premises, the administration of the hospital asserted that the facility would be beneficial to both the employees stationed there and the people who frequent the hospital. Notably, the number of ATMs in J&K has gone up to 1174. Overall, the bank has a network of 1276 ATMs across the country. Khyber Medical Institute is a recognized name in patient care and is frequented by people requiring medical attention from all parts of the valley.